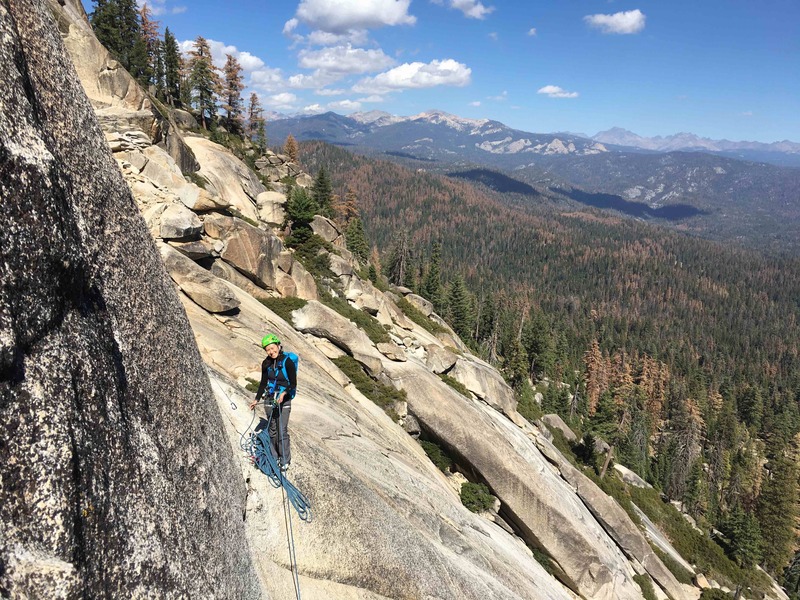 Shuteye Ridge is an area just South of Yosemite with hundreds of climbs, a continuation of Yosemite’s granite quality that can also offer knobby faces and typically very little crowding. 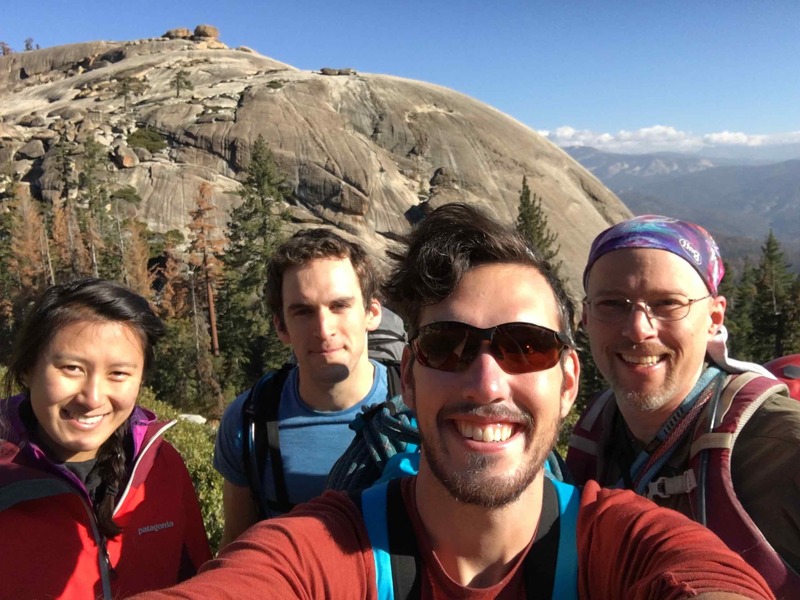 For example, there are 24 routes on the 600′ Queen’s Throne dome, but my group of four was the only one climbing on it last Saturday. This area doesn’t get much traffic simply because its hard to get there. Most areas require beating up your car or a high clearance vehicle while anything labeled four wheel drive also requires serious nerve and at least 31 inch wheels. Mountain project only has like 20% of the routes in this region and having a guide book is essential. Finally, if you want something easy to get to in the region without the clearance requirement Chiquito Dome is the place for you. Our drive out here was about 4.5 hours. Google Maps worked really well even without cellular using a GPS coordinate (37.374960, -119.432392) to the Blue Zone 2WD camp. 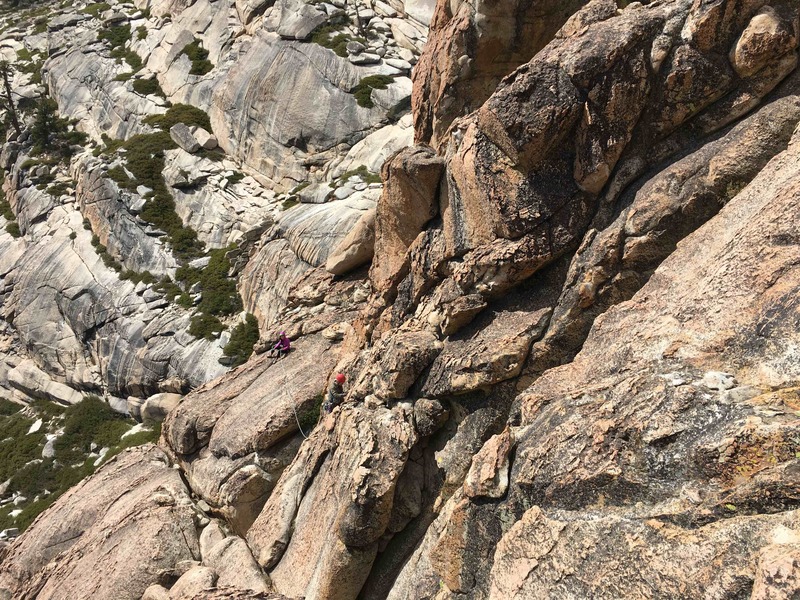 On Saturday we trad climbed four long pitches of Coronet (⭐️⭐️⭐️, 5.8 PG13) on the 600′ Queen’s Throne granite dome. 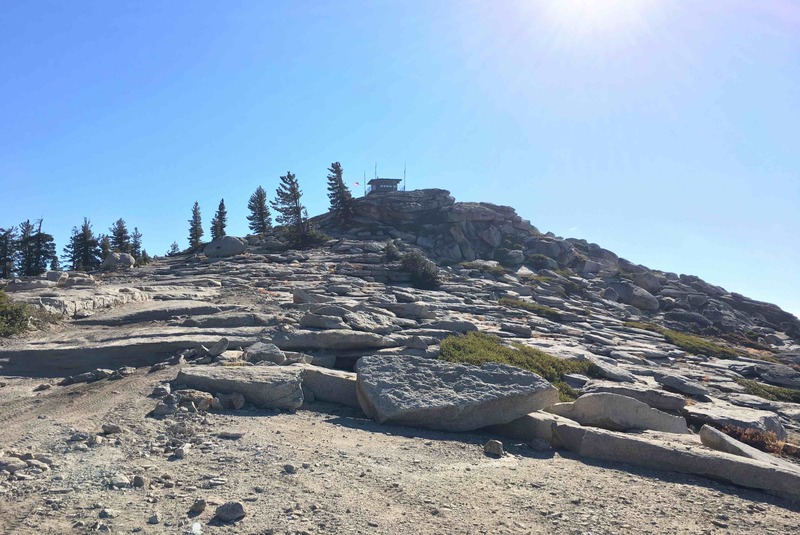 As is typical for Shuteye, there isn’t typically a clear trail to the climb and it took decent navigation down to the base. The 20-30 ft 5.8 PG13 slab traverse on the first pitch was pretty heady for me. In fact, I took the biggest lead fall I’ve taken halfway across the traverse on the tricky intermediate foot, falling/swinging 15 feet. Fei following. Halfway through the traverse about where I fell. The second pitch was probably the only ⭐️⭐️⭐️ pitch of the climb and my favorite. 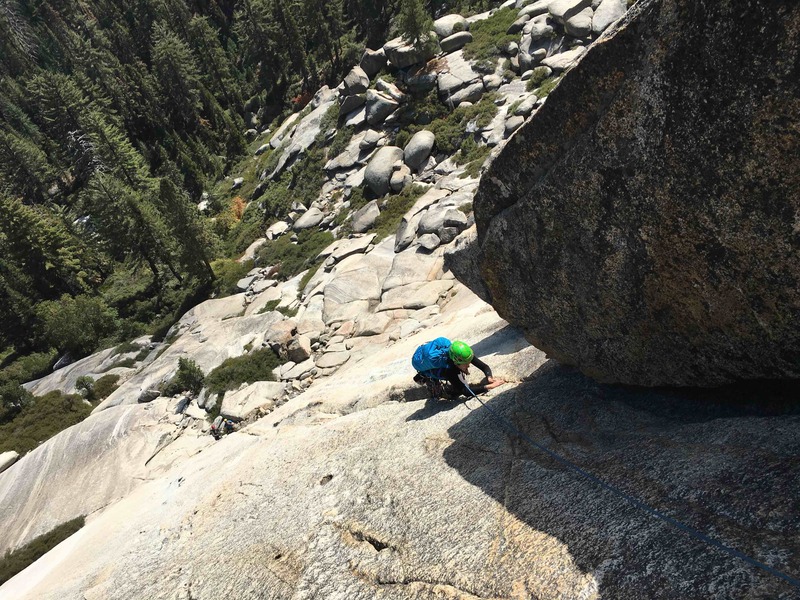 A decent slab climb leads you a solid crack that you can cruise up with hand jams and solid feet to gear belay just under a roof. Pitch three was an easy knobby climb up to a ledge and pitch four is mostly slab and very tight on rope. You are supposed to go past old anchors to new ones like 15 ft beyond, but I ran out of rope and had to set up belay between the two in a very hollow sounding flake. Not at the higher anchors, we belayed a fifth pitch and set up a mini-pitch top anchor. I’d advise checking your rope at the old anchor before continuing to avoid the flake belay. Fei following up the killer second pitch crack to belay. This 600′ climb ended up taking a long time, like 5-6 hours. In our little time left before sunset we walked 15-25 minutes to the Dreamscape area which has a bunch of single pitch walls split between trad, mixed and sport. I wanted to get to the furthest Hawk Tower face, but with darkness coming and the more technical ‘worm hole’ or alternate rappel down to it we climbed closer faces. Vision Quest wall offered easy, unremarkable routes while the real fun and interesting climb happened on a nearby wall with Fish Lips (⭐️⭐️⭐️, 5.10c sport). The first bolt was high and the beginning moves were the crux for me so I ended up climbing the nearby ledge to clip the first bolt. After rappel down it was a 45-60 minute walk back to camp to a wonderful campfire under a glorious star blanket sky void of moon. View of Sundial before the descent into the gully to the base. Path requires a lot of route finding. 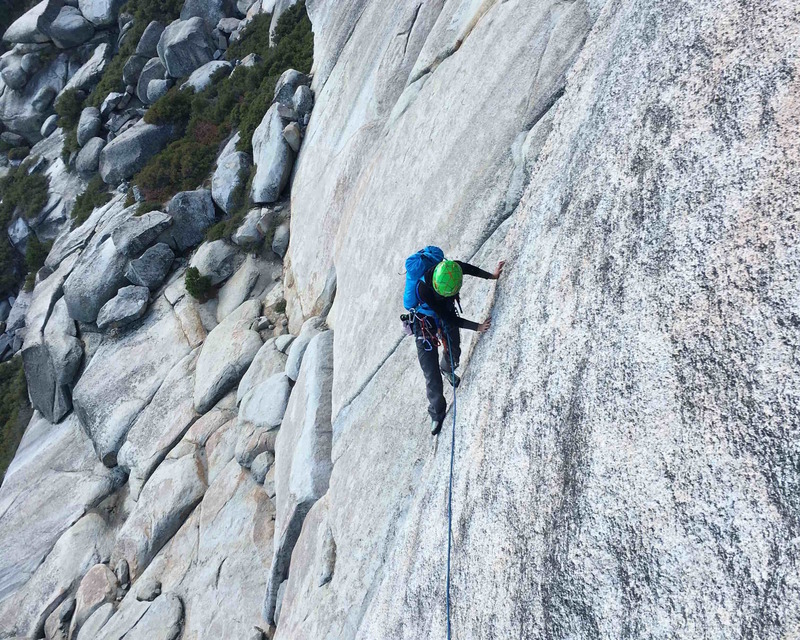 Sunday I wanted to head to the rarely visited Yellow Zone to a more rarely visited face called Sundial which offered multiple 3-4 star multi-pitch trad climbs. This required going up the 4WD section of Shuteye Ridge Lookout Road to its terminus. In our big truck with 4WD we made it halfway until I felt uncomfortable driving over these 1-2 ft slab blocks. The book is serious with recommendations of winches and rescue vehicles for this road so I parked it and we hiked the rest of the way. It took us 1.5-2 hrs from the truck to find our way to the base of Sundial. 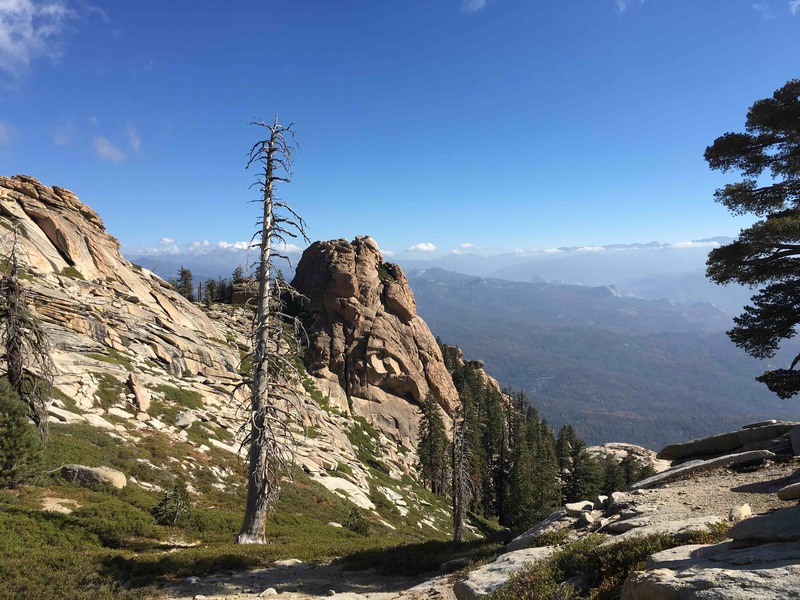 The trails marked in the guide book map are not visible in real life when we left the road from the lookout down a slab and descended between the two granite features. View of Shuteye Lookout near the end of the road. My partner and I climbed Playing with Matches (⭐️⭐️⭐️⭐️, 5.9) which is two long trad pitches with bolted anchors. I started inside the pillar on a 10a variation instead of up the pillar doing some hard finger moves that was heady even with a cam in for my first protection. The first pitch is a solid ⭐️⭐️⭐️⭐️ with fun cracks and really enjoyable, great flow. The second pitch was pretty straight forward and easy to the top. Top of first pitch where it gets knobby. 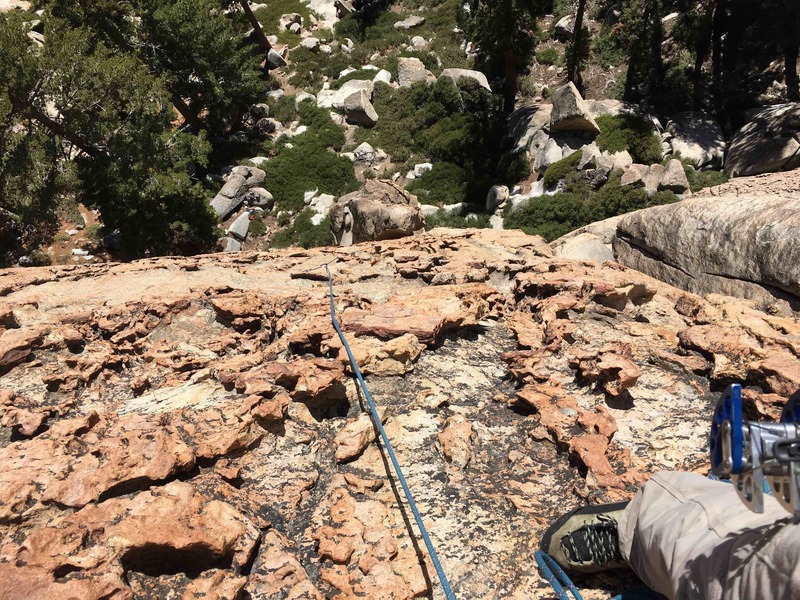 A double-rope rappel is required for descent so we waited on a big ledge for our other partners to finish Follow the Light (⭐️⭐️, 5.7) and traverse over to us. It took us two hours up, one hour waiting and two hours down. It got really cold as the wind picked up significantly and the sun disappeared on this 9000 ft face. I was shivering in just my light wool shirt and moving any way I could to keep warm during the three hours after reaching top anchor. Traverse from ‘Following the Light’ our ‘Playing with Matches’ ledge / anchor. The wild drive, long approach and the double length rappel brought us to 3pm so we decided to head back since there was some possible weather later in the evening. It took us a little under 1.5 hours back to the truck now that we knew where were going. We didn’t find a trail back to the road, but this area is so rarely visited that I doubt there was even a trail to follow. Fei, Tim, Me and Mark just before heading to climb Queen’s Throne (background). I love Shuteye because it is a wild place with a large quantity and diversity of climbs. I can’t wait to go back and I have three other trips weekend long trips spec’d out to other sectors/zones. An awesome time!